Next in the series on Golden Valley Meat Snacks is this Original Ripple Cut. Read last week's review of their Original variety. Golden Valley Meat Snacks is a new brand of jerky Intermountain Natural, LLC, of Idaho Falls, ID, which built a reputation on making all-natural and organic jerky through their Golden Valley Natural brand. This new brand appears to be positioned to compete top brands like Jack Link's and Oberto. 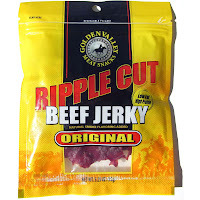 This "Ripple Cut" is described by the company's spokesperson as being sliced more thin and therefore made for "ripping, tearing, chewing and savoring and a bag tends to provide a good deal more jerky enjoyment." 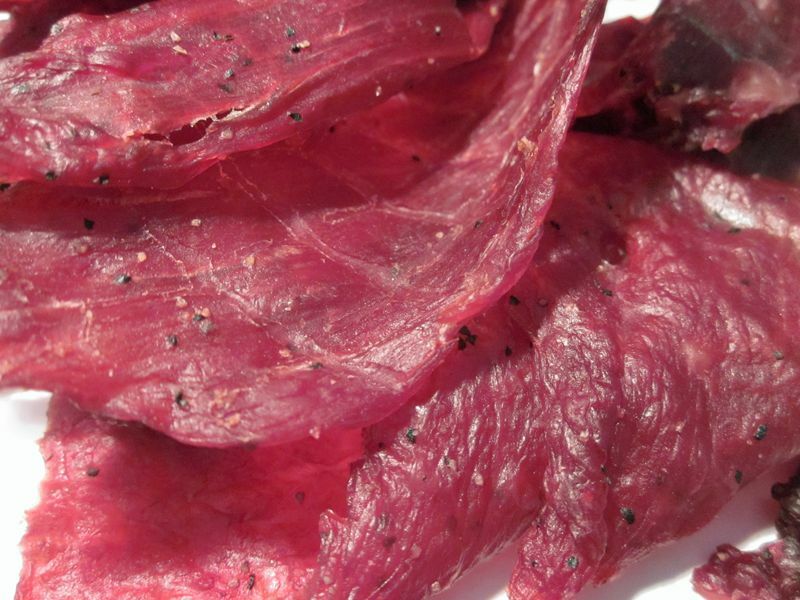 Interestingly, ripple style jerky is something that Intermountain Natural's founder Roger Ball is familiar with, having introduced it years ago with his old King B brand of jerky, which he subsequently sold to Jack Link's. The first thing I taste from the surface of these pieces is a light saltiness. The chewing flavor starts with an increased saltiness, and soon after a little bit of black pepper is noticeable. If you read last week's review of Golden Valley Meat Snack's Original Beef Jerky, this Original Ripple Cut appears to be the exact same jerky when comparing the ingredients list and nutrition facts label. So I don't anticipate any different flavor. However it's worth noting that the nutrition facts label of this Original Ripple Cut shows 80 calories per ounce, whereas the Original Beef Jerky is 60 calories. I'm not sure where the additional 20 calories comes from, perhaps this is a different grade of beef? But just like the Original Beef Jerky, the primary flavor of this Ripple Cut is the saltiness, feeling like it's at a medium-high level, even though the nutrition facts label shows a lower sodium content. There are no natural meat flavors in this, and no other seasoning that I can notice. With a name like "Ripple Cut" I expected to see some visible cutting patterns on this meat that I could point to and easily recognize as being ripples. But there's nothing noticeable; it looks exactly like the brand's Original beef jerky I reviewed last week. But this does appear and feel to be a little more thin. Overall, I believe this is in fact easier to rip and tear apart, but not by leaps and bounds. I think the only way you could tell is if you compared this side-by-side with the Original beef jerky like I'm doing. Otherwise, you'd probably never know the difference. This is a dry jerky with mostly a dry surface feel, except for maybe a thin coating of oil. These pieces have that soft rubbery consistency that allows them to bend a full 180 degrees on themselves without cracking apart. Overall, chewing seems about the same as the Original beef jerky, which is easy. The chewing texture starts out feeling like soft pliable plastic and presents a mild bit of chewing resistance. But these thin cut slices seem to let them chew down easily without any strenuous jaw work. Once chewed down to a soft mass, they have a meaty feel, but more soft and a little mushy, similar to a steak cooked medium-rare. Most of these pieces appear to be free of fat, with the exception of one piece that had a little bit. Otherwise I saw no streaks of gristle or tendon. There's a little bit of stringiness, but nothing resulting in an unchewable wad of tissue. It's somewhat clean eating with my fingers picking up a fine coating of oil, but not requiring a finger licking. Yet it's still enough to pull bits of black pepper off of these pieces. Intermountain Natural was not able to provide me with prices for this jerky, and they don't yet have this listed on their company website. I'm assuming it'll run at the same $5.99 that you find with Jack Link's and Oberto's for the same package size. Considering it's a 3.25oz package, that works out to $1.84 per ounce. For general jerky snacking purposes, at the same $1.84 per ounce price, it seems to present a fair value. I'm getting a low level of snackability for an overall lackluster flavor, a rubbery meat consistency and average chewing texture. 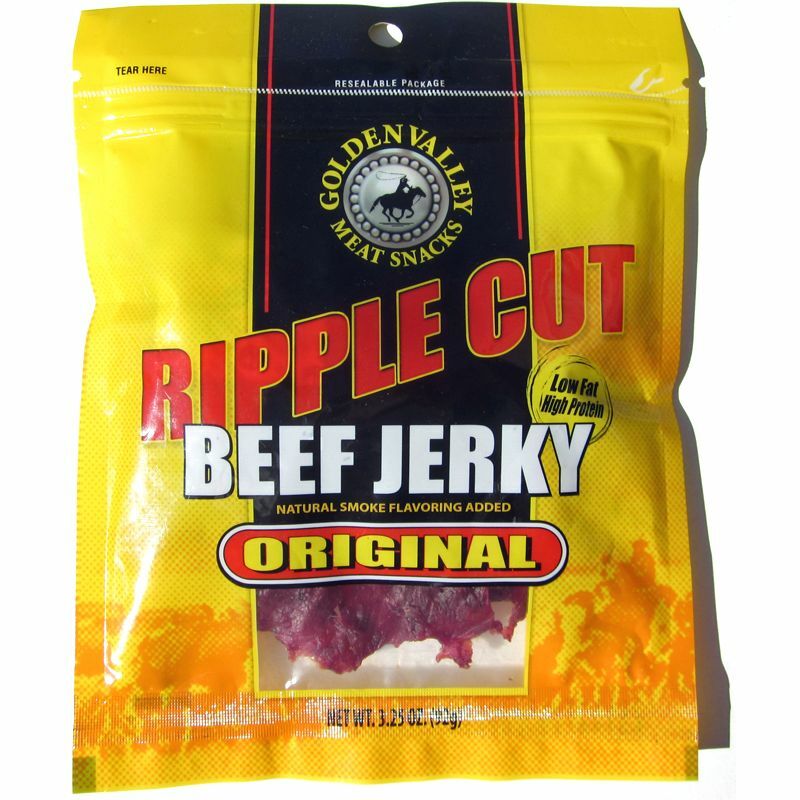 This Original Ripple Cut beef jerky from Golden Valley Meat Snacks provides a mostly a medium-high salty flavor with a noticeable shade of black pepper, with nothing much else. I'm not getting any natural meat flavors, and not much else in seasonings. 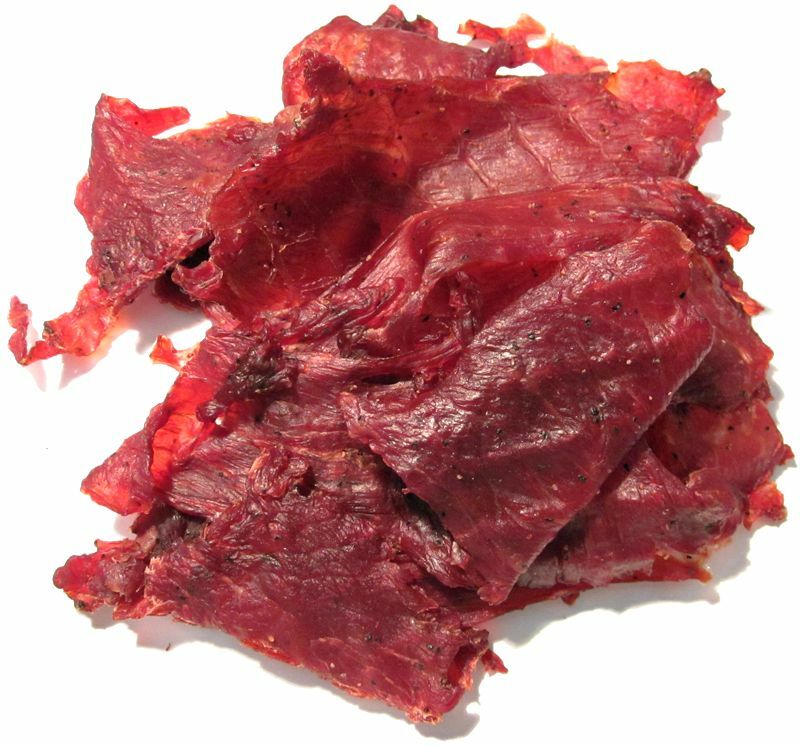 The more thinly sliced pieces should be a welcome hit with those jerky snackers who love this style, but while it's a little more easy to tear apart, I don't find it any more easy to chew, it's still overall easy to chew, just not easier than the Original beef jerky. But if I had my choice between this Original Ripple Cut and the Original beef jerky, I'd go with the Ripple Cut. I would agree with the company that it does provide a little more jerky enjoyment, but still not quite enough to boost its rating. My recommended beer pairing for this, try a simple pale ale, go with a Stone Pale Ale or the Sierra Nevada Pale Ale. Did these guys use to be King B? I grew up loving that brand, and it seems to have disappeared but I think they were based in Idaho, and they had "ripple cut". Roger Ball used to own King B, and he sold it to Jack Links. Ball went on to start Intermountain Natural, the company who owns Golden Valley Meat Snacks. Awesome, thank you for clearing up that little mystery. They were really nice people to deal with, and that gives Golden Valley instant props in my book.